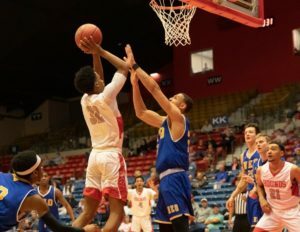 Moberly Area Community College opened with a first-round win in the National Junior College Athletic Association’s championship with an 82-73 victory over NE Oklahoma A&M. The Greyhounds have a second-round game Wednesday evening against third-seeded Vincennes. Alonzo Verge led Moberly with 25 points. He was one of four players to score in double figures. The Greyhounds jumped out to a 9-0 lead and were up by as many as 11 before NEO closed it to three on a 14-3 run to end the first half. NEO took the lead at 44-43 with 13:31 to play. Moberly led 54-52 but added some distance with back-to-back three-pointers. Verge scored 20 of his points in the second half.